The Psychoactive Substances Act comes in to force at midnight on Wednesday 25 May. 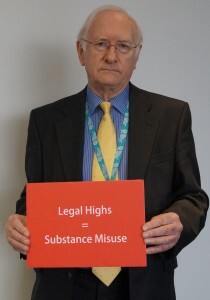 This means that Legal Highs will no longer be legal to produce, distribute or import. Legal Highs are Psychoactive Substances that mimic the effects of illegal drugs such as cannabis, cocaine and heroin but are produced from chemicals that are un-licenced and dangerous to users. These substances were dubbed legal highs because the chemical build of them was not ill-legal and if one chemical became illegal, the ingredients were changed to make them legal again. “In recent years the availability of Legal Highs or psychoactive substances has caused growing concern. Young people in particular assumed that because they were legal they were also harmless and too many have suffered as a result. This was because no one ever knew what the chemical substances were in what they were swallowing. “This was why we ran a campaign – supported by all our local football teams – to alert people to the dangers and to join with local MPs in urging government action. Anyone caught breaking the law by producing, distributing or importing legal highs could receive a prison sentence for up to seven years.